Let it be known… LOL… That our comments have been down a while, but are now back up as of August 12, 2018. Yeah! Here is a nice post that debunks personality tests. Has anyone run across or have experience with David Kolb’s Experiential Learning Theroy and the Learning Style Inventory? I’ve recently run across a LinkedIn post where someone is advertising a class on how to implement it. I did a quick search on Kolb and he’s written quite a few books and articles. Most of his work was done in the early 80s, but I’m also seeing current research being done using both the Experiential Learning Cycles and the Learning Style Inventory. I found an article where he replies to Freedman and Stumpf who apparently criticized his Learning Styles Inventory. I am not able to share it here. Full disclosure, I haven’t read all of it, nor have I been able to dig too deeply into it, which is why I’m bringing the question here. Thanks. What suddenly struck me was how at odds this “research” is with that of learning styles. If learning styles are a thing, then shouldn’t the percentages vary at each level of the cone depending on the individual’s learning style? I’m wondering why I’ve never seen any debate about this inherent contradiction from proponents. …”accessibility efforts …can even serve students who don’t have learning disabilities but learn better from reading text than hearing it out loud…”. I see this all the time. Two problems with it. One, it so obviously assumes that learning styles are legitimate AND that the reader knows that and agrees with it. The term “learning styles” isn’t even used and doesn’t have to be. What’s not said is just as important as what is. And two, used in the context of accessibility, this kind of statement means precious resources of time and effort are being taken from REALLY making content accessible to PRETENDING to by addressing learning styles. This is why addressing myths about why people learn is so important. Real people with real learning problems don’t get helped when we mess around with junk science. Robert Bacal posted this article on LinkedIn, which he found on Medium. It interestingly shows that commercial interests and motivations might have propelled the creation of the Myers-Briggs Type Indicator. I’m sure there will be more studies to come. We live in a time where fake news, misinformation, deception is rampant. Researchers will want to take a look to see what can be done. I am moderating a webinar teaching litigation support people how to write reports. The lovely slide of Edgar Dale’s cone defiled by percentages appeared with a “University of Texas” at the top as if this was a theory endorsed by them. That led me to a series of searches that ultimately landed me on this website. This piece from Campus Technology features people from my college who are part of the accessibility initiative at our university. It’s shot through with references to Learning Styles as a justification and argument in favor Universal Design for learning. One of the ways you make your learning “universal” is to attend to different learning styles. It’s maddening. This is a great example of debunking a myth. It’s not a learning myth, but the speaker does a great job of slowly, methodically crushing the myth. While “brain science” and “neuro-” seem to be really hot nowadays, the NLI is at the forefront of pushing this belief system. I worked at a large company, in the Sales training group. They totally swallowed the NLI. They did not have a grounded learning program, could not identify what competencies actually were required to be successful in their jobs. They had a pretty LMS, with pretty, flashy elearning, mostly unrelated to the target audience’s actual skills. And they slipped in NLI lingo every chance they could. I went to an NLI conference. Every insight NLI offered, while flashing pictures of the brain lighting up in different colors on the screen, came from Adult Learning, Instructional Design, and real learning science. I approached the NLI leader at the end of one session, proferred that observation, and asked if he was familiar with real learning research. His eyes sort of glazed over and he muttered “Interesting.” before heading off to engage with his starry-eyes acolytes. Will, is there a section devoted to debunking “Neuro-” (fill in the blank) approaches to learning? A Neuroscience section might be useful. NLI is wasting millions and millions of dollars of corporate L&D budgets. You’re right, Will, this is an interesting article. We all should be cautioned because words DO matter. BUT…we have to be careful to not veer into censorship. I’m always a little leery of the argument that we have to protect people whose critical thinking skills are not very well developed, be they kids or less educated adults, from viewpoints that might “harm” them or lead them to believe falsehoods. That’s a little condescending to me, and taken in a different context, sounds a little like brain washing. That’s not the point of this writer, I don’t think, but it’s an argument I’ve heard before in defense of censorship. out in the air and then addressing them can they be countered. That’s why I appreciate the Debunker Club. We change minds by pointing to those voices and providing the evidence why they’re wrong. While looking for scholarly studies including meta-analyses for the efficacy of “Emotional Intelligence” training I found a couple studies with some positive results, but there were problems like sample-size and study design that are hard to dismiss. I am not suggesting that EI isn’t something real, but I have a feeling all the EI Training that corporations are spending millions of dollars on may be worthy of attention. Does anyone have any good references for this? An interesting two-fer spotted on LinkedIn. A user posted a link to the infamous Learning Pyramid. This conflation of two debunked semi-scams was just missing a mention of Learning Styles for a trifecta! Oh, I love it when learning myths collide! So, this isn’t a myth I’ve heard about, but it sounds dangerously close to being one. The idea is that the optimal score on a test should be 85%. Higher than that and the material was too easy for you; less than that and the material was too hard. The 85% mark hits the “sweet spot” for optimal challenge. I like the idea of learning being like a video game: too easy and it’s boring; too hard and it’s frustrating. But attaching numbers like this always makes me uncomfortable. I haven’t read the cited articles in this piece yet, but I will and will chime in again then. In the meantime, is it just my Myth-dar that’s going off here? I just saw the article on this (from three days ago on 14 January 2019), and accessed the original study. The research is NOT really generalizable. They do a study where (and you won’t believe this), “ambiguous stimuli must be sorted into one of two classes.” Where do real learners learn by sorting ambiguous stimuli? This is complete poppycock! Watch for it… We will soon be told to shoot for an 85% cutoff score on our knowledge checks! I don’t even know what that means…”sorting ambiguous stimuli?” Do they mean…guessing? I went back to the research article to find you an example. In reading the paper more closely, I found that they didn’t even do an actual experiment, they just did mathematical simulations. The fact that she talks about the research around learning styles and that we all learn differently got my back up right away. Plus it is a proprietary tool that the article is about. I’ve never heard about listening styles before, so thought I would throw it out to the group. A google search show a few results, but not in a training context. Curious to hear what the group thinks. 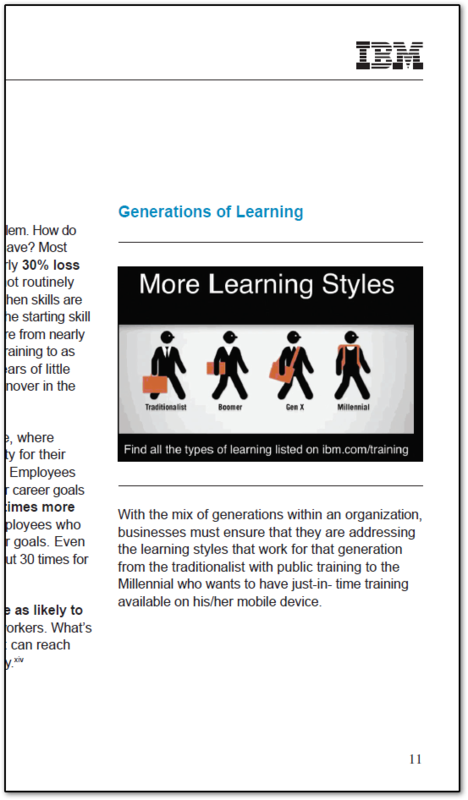 IBM Training (https://www.ibm.com/blogs/ibm-training/) has available (today) on it’s website a report called The Value of Training. It is copyrighted in 2014. It encourages the use of learning styles.